Kevin Mwangi was born and raised in a Mungiki family of nine siblings. His father was head of Mungiki in Mathare slums, Nairobi, where his family was dreaded. All four of Mwangi’s brothers followed in the footsteps of their criminal father and became armed robbers. They were all gunned down. When the post-election violence broke out following the bungled 2007 elections, their neighbors turned against them, burned their house and evicted them. “It was a shock to my dad as all his cash was stored in the house. His entire life savings were reduced to ashes,” recalls Mwangi who was left at the care of his five sisters who had fled with their dad. “My father tried recruiting me into Mungiki, but I resisted. In fact, he despised and often called me a coward who couldn’t shed blood. There was a day he scolded me so badly, I hired a gun, loaded it and stepped out for an ‘operation’. He even blessed and advised me to be careful,” Mwangi narrates. When the family was evicted, Mwangi sought refuge in a church, where he sang in the choir, but he was later kicked out. Desperate, Mwangi found a home in an abandoned kanjo toilet which was flooded. “I unblocked and cleaned it and started charging residents Sh5 to use it, but it also doubled up as my house,” he said. Mwangi, who was making a substantial living from the venture, attracted competition and was attacked and chased from the area, forcing him to relocate to the Dandora dumpsite. Here, Mwangi became a guard before being lured into crime, robbing people in Westlands before retreating to the safety of the dumpsite. “I engaged in crime after rejection from the people I thought could hold my hand and guide me. I expressed my bitterness through crime, hoping it would help me end my life easily instead of struggling and paying for my father’s mistakes,” he explains. Mwangi’s gang members were later gunned down by the cops, with Mwangi changing his life for the better after surviving six attempts by police to kill him. After escaping death narrowly for the sixth time, this was after an aborted plan in Westlands, Mwangi boarded a matatu to Dandora which had a pastor who was preaching. Mwangi would later reconcile with his neighbours in Mathare and a chance meeting with someone looking for a German shepherd totally changed his life. 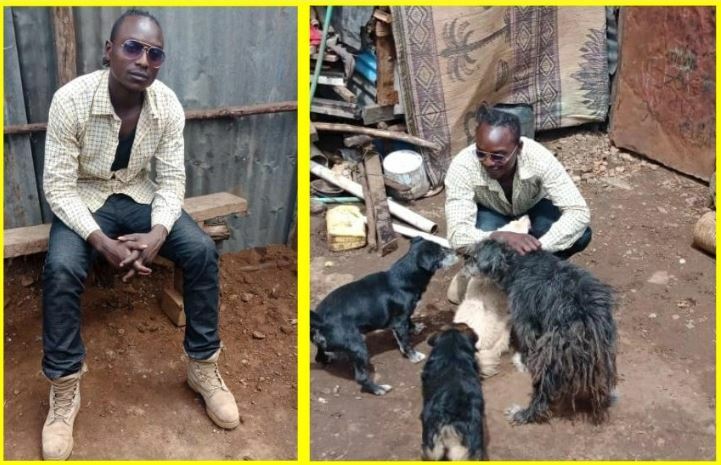 “I took him where he bought the dog for Sh40, 000 and I was given a puppy free of charge,” he recalls of how he began breeding dogs and later selling puppies for Sh15, 000. Mwangi now supplies eggs in Mathare, breeds commercial turkeys and is a renowned breeder of German Shepherds, which he sells for between Sh12, 000 and Sh15, 000, besides training talented musicians and skaters in Mathare.